Andromeda is the home of the most distant object visible to the unaided eye, the Andromeda Galaxy or M31. 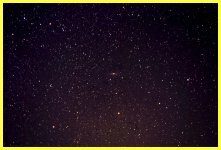 Its most prominent stars are the three that sweep in an arcing line to the right of Perseus. These three are seen across the lower part of the photograph. M31 shows quite clearly, in fact more clearly in this 20 minute exposure than it shows from my dark garden.